Reassuring Guarantee For The People Of India | Quest That Change…. The Mahatma Gandhi National Rural Employment Guarantee Act 2005 (MNREGA 2005) enacted by the Government of India in 34 Indian States and Union Territories aimed at enhancing the livelihood security of people in rural areas by guaranteeing 100 days of wage-employment annually to an adult member of a rural household to do unskilled manual work. The Act now looks more in paper than in the field. The 100 day guarantee could only be recorded up to 50-58 days, while the benefit/security lands in the pockets of the administrators and politicos. It is now said that the guarantee could only do good in digging and filling the pot holes because it lacks in generating rural ‘employment’ in real sense to the poor. The major flaws in the Act (implementation) as pointed out by the people, think tanks and researchers are related to poor implementation of programme due to the authoritarian attitude of district administrations involved and corruption in the payment process. This, they say, defeated the purpose of guaranteeing employment to the rural poor and ultimately gratified the corrupt administrators. In big Indian states like Uttar Pradesh, most of the jobs are done by contractors through JCBs (earth moving machines rather human being), and the job-cards are used to siphon the money. A new, enthusiastic and active rural development minister is leading the scene, and it is perceived that he is on his way to reforming the whole scenario of MNREGA and many such rural development programmes including rural drinking water and sanitation. 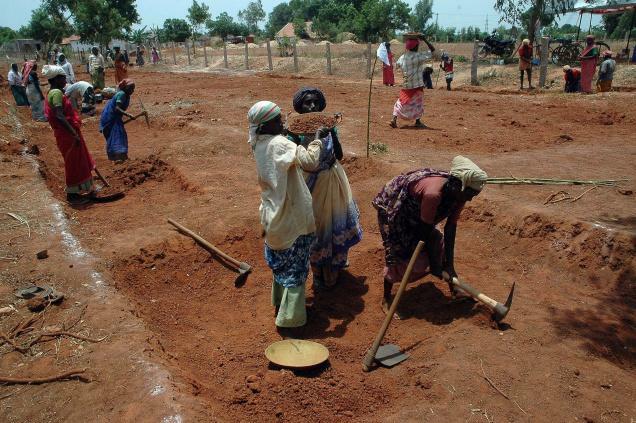 The idea of digging holes and filling them up will now require a re-look into the aspects of agriculture, watershed management, horticulture, agro-forestry, various livelihood options (like fishery, poultry, craft making, etc.) etc. also, which in real sense will help the people in getting the guaranteed employment in a sustainable manner. The amendments will take effect from 1 April 2012. May be it’s pure coincidence but this day is known as fool’s day. Altogether the Water Resources Ministry of Government of India is revising its ‘water policy’ (since 2002) while the Ministry of Drinking Water and Sanitation is looking seriously into its drinking water supply monitoring and quality systems and the ‘Total Sanitation Campaign’ (TSC; a sanitation drive of government of India) in its newer version with school sanitation as priority. On the water policy draft the government of India also asked for suggestions from people, where questions are being raised regarding the deliberate inclusion of ‘business’ of water in the policy; given that water has two dimensions in India – the first one it’s a state subject and the other one has been declared as basic ‘right’. Doubts have been raised about the intension of government (policy makers and agencies) in the provision of water for industrial operations, hydropower projects and water businesses, and its judicious allocation in agriculture and drinking purposes. While the present draft water policy document contains some inclusive provisions, there are speculations related to the implementation, monitoring and coordinated efforts in the direction of laid down provisions. On rural sanitation front where India could hardly reach to a figure of 40 percent coverage, the responsible ministry is in a mood to increase the provisions of subsidy and removing the divide of APL (Above Poverty Line) and BPL (Below Poverty Line), and village as a unit to have full sanitation coverage by 2022. There are issues related to actual coverage and about the fate of Nirmal Gram Puraskar (NGP: a token of monitory appreciation to a Gram Panchayat or village Government by the Government of India annually) awardee Panchayat’s include some Panchyayats who are still are practicing open defecation, and households despite already getting subsidy. How good the provisions of increased subsidy will work by including other provisions needs to be seen closely. The scenario now (in most) is such that in case an agency or monitor wants to visit an NGP Panchayat (which already got a prize) to see the status of sanitation, that Panchayat needs a managed show to show everything is alright. It has also been learnt that after 60 years of independence and huge financing in water and sanitation sector by Government of India and outside agencies there are no adequate and systematic provisions for process, progress and post project monitoring for the water and sanitation infrastructure as such. In a scenario where the Government of India has many vertically running ministries and departments, there are a number projects and programmes running parallel in villages (supported by government and external agencies), leading to a disorder in terms of institutional functioning (governance), financial management and monitoring provisions. As far as coordinated or integrated approach by the Rural Development Minister is concerned, he needs to consider that almost 20 years back the Planning commission of India clearly advised the government to restrict the numbers of programme to improve the quality of programme implementation and reduce fund mismanagement. That’s clearly remained the crux of the problem till now. The disconnect and linkages between major rural development programmes, like MNREGA, SSA (Sarva Siksha Abhiyan- Education for All Programme), NRHM (National Rural Health Mission), National Rural Livelihood Mission, Indira Aawas Yojana (Rural Housing Scheme), TSC (Total Sanitation Campaign), Rural Water Supply Programme, Integrated Child Development Scheme, Land Reform programme, Horticulture Mission, etc. are among the few those certainly need a serious thought on three important premises of Institutional Coordination, Financing and Monitoring. If required the programmes could be reduced or merged together for better results. The provisions of dummy committees and monitoring bodies under the administrative control (of state and district authorities) need to be removed as many committees and monitoring bodies formed at the state and district levels don’t have adequate powers and control on the ongoing programmes. If at all, these committees and bodies should function in transparent manner while giving sufficient importance to a practical and robust ‘social audit’ system at village level. To develop a programme /project or do a social audit in a rural development programme there should be adequate provisions for open discussion and debate, after which only the approval could be sent to the district or state level bodies for their action (mainly for technical support and release funds). Minimum powers should be given to the block or district administration, which has already been proved one of the main channels of siphoning money from rural development programme and also responsible for poor implementation. Therefore, while devising new policies or revising the existing policies and plans, the poor and marginalized rural people of India want the reassured guarantee that they at first hand are involved in the process and discourse of development. This applies to all major sectors like water, agriculture, education, sanitation, land development, forest, livelihood, and housing, among others. The bureaucratic system that still enjoys (and deliberately wants) the top-down approach needs a serious push in terms of giving more powers at the bottom of the pyramid (to the people) in planning, managing and auditing their progress in a systematic and planned way. And this systematization and planning can only come when we empower and develop their (people’s) capacity at a level, where they could lead the scene. In this way not only government agencies, we need to also consider the institutional functioning of businesses, civil society groups and international agencies working in India in rural development sector all across. Therefore, simply the revisions in policies will do nothing. What are required are efforts in institutional reform and giving importance to social auditing by giving more powers to the people and local representatives.